OneNote is one of those Microsoft products that seems completely useless when you first start using it, but it isn’t until you actually make use of the product that it’s true value starts shining through. As a task and project management tool, Microsoft OneNote is one of the best tools out there. Why not just use the Tasks feature in Microsoft Outlook How To Export Your Outlook Tasks To Excel With VBA How To Export Your Outlook Tasks To Excel With VBA Whether or not you are a fan of Microsoft, one good thing that can be said about MS Office products, at least, is how easy it is to integrate each of them with one another.... Read More , you ask? Well, there’s really no reason you can’t use both. Each have their place in your productivity toolbox, and they each compliment each other as well. 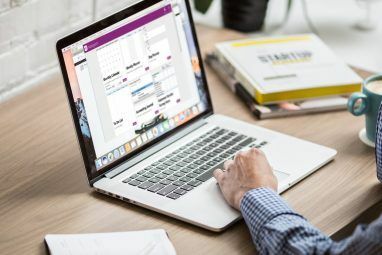 In this article, I’ll show you how you can integrate Microsoft Outlook tasks and Microsoft OneNote to better manage the complexities of the multiple projects you have going on in your life, or at work, at any given time. I’ve used Tasks in Microsoft Outlook for many years. As a daily overview of everything you have to accomplish, nothing beats it. You’ve got due dates, task descriptions, and priorities available at a glance, and you can even categorize them into the specific projects you’re working on. The biggest benefit to Tasks – its simplicity – is also its biggest drawback. Although you have the ability to write notes when you open individual tasks, the features that are available within these notes are very limited. Text is great, but what if you want to organize the many spreadsheets, documents, meeting notes, and the many other records that go along with working on these tasks? 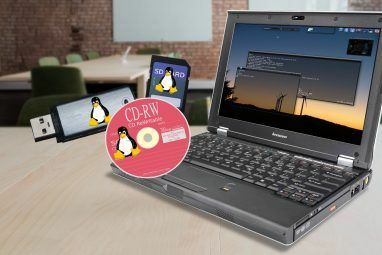 What you need is a sort of folder or notebook where you can store all of that information for each task, organized with tabs, and available at your fingertips when you’re reviewing your tasks and deciding what to work on next. Thankfully, you can do this with OneNote, since it integrates so perfectly with Microsoft Outlook (but unfortunately not with Outlook.com aka Hotmail). To do this from within Outlook, just click on File and then Options. Along the left navigation menu, click on the Add-Ins link. At the bottom of this page you’ll see a “Manage” field with a dropdown box. 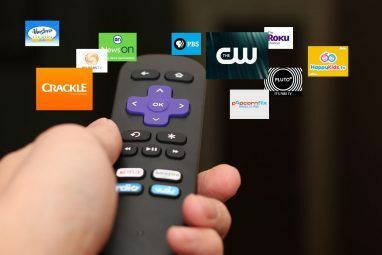 Select “COM Add-ins” and click on the Go button. If you have OneNote installed on your computer–which you should, because OneNote is free- OneNote Is Now Truly Free With More Features Than Before OneNote Is Now Truly Free With More Features Than Before Evernote no longer rules the roost of note taking apps. Microsoft recently announced OneNote would be more free than ever before. Let us show you what this means in terms of features and functionality. Read More -then you’ll see an Add-In here titled OneNote Notes about Outlook Items. Select the checkbox next to this, and then click OK.
Now you’ll discover “OneNote” icons all throughout Microsoft Outlook, but the one we’re most interested in is the one that now appears at the top of your Outlook Tasks page. 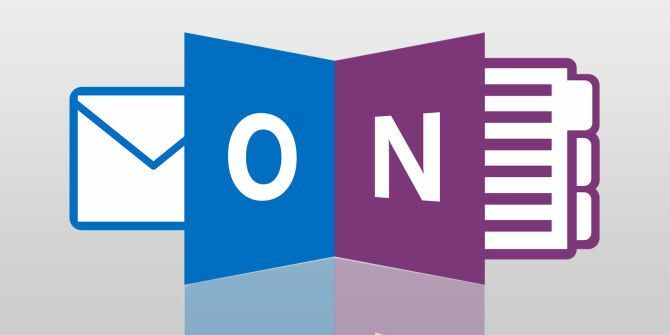 Now that you’ve integrated Microsoft OneNote with Outlook, it’s time to put it to work to get more productive 5 Ways to Get Productive With Microsoft OneNote 5 Ways to Get Productive With Microsoft OneNote Do you feel the need for an offline organization tool that also exists on the web? Surprisingly, Microsoft has come up with the perfect solution - OneNote. Read More . In the following section, I’ll show you how you can create notebooks for individual projects that you’ve got going on, and then how you can create new pages for managing tasks just by clicking the Microsoft OneNote button in Outlook Tasks. First, open up OneNote and create a new Notebook just dedicated to Task Management. Now inside the Task Management notebook, you can create new sections for each individual project that you’re currently working on. All of the tasks in your Outlook Tasks page will typically fall under one project or another. Unfortunately, in Microsoft Outlook, it’s not as easy to visually organize these tasks by project. They all simply show up in a big, long list. There is the category to work with, but that’s just a column. Visually, the list looks quite intimidating. But by adding sections in OneNote for each project, you’re creating this nice, clean visual layout that lets you organize all of your tasks visually into projects (which we’ll get to in a moment). So, now that you’ve got OneNote set up with projects, you can start loading it up with Tasks as they come up. Whether new tasks arise from an email your boss sends you, assignments provided by a project manager, or anywhere else, the process is the same; create the task in Outlook Tasks, highlight it (by clicking on the task) and then click the OneNote icon at the top of the Tasks page. What happens when you do this is magic. First, OneNote will ask you what section you want to place this new “page” into. This is where you select the Project where this task belongs. Once you do that, OneNote will automatically import the Task from Microsoft Outlook into that OneNote section as a new page. Basically, sections are projects, and pages are tasks. So with this setup in OneNote, all of your projects will be listed along the left navigation bar. As you click on a project, you’ll see all of the related tasks along the right side navigation bar. Once you’ve used this setup for a few days, you’ll appreciate just how intuitive and clean it is. Even if you have 4 or 5 projects all going on at once, this setup allows you to focus right in on a specific project and see only the tasks associated with it, without all of the clutter of unrelated tasks. Remember, OneNote is great for other types of projects too. Check out how you can use OneNote to create a personal wiki How to Create a Personal Wiki Using Microsoft OneNote How to Create a Personal Wiki Using Microsoft OneNote A wiki is a great way to store and share large amounts of information. Here's how easy it is to create a wiki with OneNote. Read More . By bringing your tasks into OneNote, you provide a central space where everything related to that task can be organized. And the things that you can organize on your Task page in OneNote is impressive. You can insert tables of data (or insert an actual Excel spreadsheet if you like), attach any kind of file, take screen clippings, insert pictures or scanned images, make audio recordings, and of course, add all the hyperlinks you like. You could even create another to-do list within this individual task. What you organize in this space is completely up to you, but the point is that it allows you a centralized location to focus in on your task, without wasting time hunting through your directories for related files. Link everything here, and it’s all at your fingertips. When you feel like Outlook and OneNote don’t quite cut it anymore, check out a more comprehensive project management tool like Asana A Beginner's Guide to Using Asana for Tracking Any Project A Beginner's Guide to Using Asana for Tracking Any Project Asana is one of the best productivity tools that you can use for free. Here's how you can keep track of a project using Asana. Read More . Explore more about: Microsoft OneNote, Microsoft Outlook, Project Management, Task Management, To-Do List. Glad I stumbled upon this. It solves an immediate problem of getting organized with the tools I have available at a client site. I understand there are limitation, but until I get access to the tools I'm locked out of, this will do. Now what do we do when your new laptop has Windows 10 and uses Onenote for Windows 10 and not OneNote 2016! There is no outlook integration, it is crap! Interesting but this appears to be a one-way linkage. True integration would result in two-way linkage and content editing. That is any content changes within an Outlook task would sync up and show in the existing OneNote page. The OneNote page should also push content changes back and provide a reverse link to check on timing and progress. A shared OneNote resource should have the tracking information in the outlook task. In actuality this hopping back and forth means details can fall through the cracks. Finally, task dependencies are not managed at all. I can't even guess how this will work on a mobile device with both Outlook and OneNote installed. I would say this is great as a personal task/project management resource but beyond that a more comprehensive project management tool is needed. I live in both Outlook and OneNote and use tasks every single day as SharePoint PM but the effort is harder than the benefits as it relates to the horrible integration. I don’t understand why so many people love the integration because it is so half baked. I can’t understand why Microsoft has not fixed these shortcomings. Both products are fantastic but integrating tasks appropriately needs a massive overhaul instead of constantly adding new products such as Planner/365 and Microsoft ToDo (mobile). I totally agree. And in none of those existing or new tools do they have decent, simple handling of subtasks. Sharepoint task list maybe, but I have to cut and paste from Outlook? In planner, subtasks are basically notes in the task. ToDo doesn't even pretend to handle a real task load. Outlook and Onenote worked well for me for years, when my work requirements matched their capabilities. I now get the best results with VBA and custom fields in Outlook. Occasionally, I will take notes in OneNote. This was very interesting as I try to refine my task management system. Most of my tasks come to me as E-mails, and most of my responses are E-mails back to them, after researching something. Either that, or reviewing a document, either sent as an attachment, or in our system. I normally just put these e-mails into a To Do folder, and use Category to assign them, so they are grouped together. I have some set up as Quick Steps in Outlook, e.g. Reply Today. I don't usually try to create a Task, but tried on this one. However (Office 2010), when I move a Task into OneNote, it doesn't copy the body of the E-mail, which I need. I also have some E-mails marked a dealing with them today, and there is no way to flag that in OneNote. But I will play with this and see what I can do. I do like how in OneNote, I can just say E-mail page, and reply that way, and OneNote is a lot more cleaner than Outlook. What I do with emails is click on the email (rather than the task) and click send to OneNote. This will create a new page with the email inserted as a print out. Then, click on the title and insert an outlook flag in the title. This will create a task in outlook and store the printed email in OneNote. The downside of this is you can't reply from the email printout.. I use it more for documenting emails than I do for handling emails as tasks. If I want to use emails as tasks, I typically don't have much research needed for them so I just keep them in outlook. Thanks Brian for this tip. Where I have landed now is in OneNote I've created several sections in order of priority Today Reply, Today Review, Today Read, Later Review, Later Reply, Later Read and I just move the E-mails from Outlook into those sections. I am only using an Outlook task if it is something where I need a reminder (e.g. a training I have to do) and I will use that tip you had. I use Outlook and OneNote daily but have long since ditched using Outlook tasks. I read this article with interest thinking it might offer some new light but to me further reinforced that Outlook tasks are nothing more than unneeded overhead. OneNote allows you to create a OneNote checkbox/task instantly with a hotkey and create a summary sheet of all those tasks categorized by section - so all the tasks are automatically in context. I'm in my project list multiple times every day and so have little use for the popup reminder since this setup allows me to intrinsically know what is coming up. Meeting notes are easy to import from Outlook Am I missing something? What value are others seeing in sticking with Outlook tasks and connecting them? I use Outlook and OneNote daily but have long since ditched using Outlook tasks. I read this article with interest thinking it might offer some new light but to me further reinforced that Outlook tasks are nothing more than unneeded overhead. OneNote allows you to create a OneNote checkbox/task instantly with a hotkey and create a summary sheet of all those tasks categorized by section - so all the tasks are automatically in context. I'm in my project list multiple times every day and so have little use for the popup reminder since this setup allows me to intrinsically know what is coming up. Meeting notes are easy to import from Outlook Am I missing something? What value are others seeing in sticking with Outlook tasks and connecting them in OneNote? For me, the benefit of outlook is that the summary page is dynamic. Meaning, as soon as a OneNote task is completed, outlook is marked complete as well. When a new OneNote task is created, outlook updates the summary sheet automatically. Additionally, some people flag important emails as reminders. Outlook organizes those "to do's" right next to the tasks. So really I think it is just to help organize OneNote to do's that could be scattered in the same place as email flags. I was so excited reading the article as love Outlook and using it for years as my personal life project management tool. Thanks for the comments and see nirvana is sadly not the word to describe the OneNote + Outlook combo. The inability to pull one daily to do list, a sync issue, and IPhone concerns stopped me cold. That said I am looking for a simple "project management" tool to intergrate with Outlook to organise the next half of my life. I tried Wanderlist and Google Keep and found both frustrating and time consuming ... the list heirarchy is either too rigid or too something but neither flowed like I felt they could. Suggestions from anybody would be great as I am tired of trying the new apps only to find a showstopper hidden in the heirarchy. Yes, I've tried Asana, it blows. On top of that it's run by a former Facebook founder, they are notorious for collecting you're personal information in order to monitize it. I don't need Asana making money off me keeping track of tasks. Absolutely hate Asana, could recommend staying away from it any stronger. I have been using OneNote and Outlook tasks (with the OneNote add-in installed) and have run into a problem. When I complete a task in OneNote it is not completing it in Outlook. Also, sometimes the link to OneNote is broken and I cannot find the spot in OneNote that it is referring to. Do you know how to fix either of these problems? Same problem:I am finding that the link between the OneNote ToDo and the Outlook Task is often broken, even though both exist and neither was marked as Completed. Don't know why. Maybe simply editing in OneNote and moving the ToDo? Maybe losing the connection to OneDrive and losing sync to OneDrive? In any case, it's enough to cause me to abandon this approach. Interesting. In my case it has nothing to do with OneDrive because I am on a work computer where it is not used Win.7, Outlook/OneNote 2010). I know what you mean, and this problem leaves Outlook to not being good for organization. However I am going to keep trying it in OneNote. I have been trying to use OneNote with Outlook tasks and have run into a problem. When I complete the task in OneNote, it is not competing in Outlook! I have the OneNote add-in already installed and active. Do you know how to fix this problem? Thanks! Great article! I'd like to know more about integration of outlook categories into onenote and/or vice versa. Does anyone know how to establish this? Can this method be used for task management in a group, i.e. in a project to share the total status of all tasks the group is working on? Is there also an OneNote app for tasks on iPhone that is integrated or are there other tools/apps more convenient for a group working together? My main demand is a efficient task management tool for a group of 5-6 people working together in an Microsoft business environment. Pity, in OneNote 2016 (and Outlook 2016) it doesn't work anymore. OneNote 2016 is super-simple (which I actually appreciate) but its missing one super-important feature: to list all tasks (tagged with the task box) so that I can see my todos. Does this work for the mac version? Does this work with Office 365 version of Outlook so I can see all the project tasks on my desktop, laptop and Android tablet and phone? If yes, is anything stored locally or is it all in the cloud? It would be interesting for me to know how you solve the problem of not being clear WHEN a specific project (=Onenote section) is ready - means all tasks (=pages) are checked as done. Any idea or help for me? Is there a way to have a link back to the original email / conversation once in OneNote. The only connection is a ability to complete the task. for link to "OneNote" you can use Linker for Windows from TeamScope.com (free). Linker for Windows use Hyperlinks to any outlook Object. Is this valid with Outlook 2016? I am only seeing "Send to OneNote" nota "Link to OneNote"
one downside about outlook and one note is that if you have SQL queries in outlook. Copy paste the SQL from Outlook to OneNote adds UTF-8 code that screw out the queries. Then when you need the SQL queries, you copy it from One Note to SQL Query analyzer it will not work!! Great article Ryan, really helpful and without doubt a good complement to Task in Outlook. I will for sure will try it. I do tend to agree with some comments from others that does not solve some problems like nesting task, but you can also create To-Dos within the OneNote page (even creating a task from there). I would like to share though that there is a plug-in from NetCentrics called GTD Plug-in for Outlook that in away allows you to create projects and subprojects, and in a way next tasks. I have been using it for a couple of years and works "OK". And it also allows you to automate certain things like create a task automatically from e-mails or events in calendar. I still find it a bit clunky, but works (I thought it was worth sharing). Though I will definitely try to use this approach with OneNote as it complements this, in a way that I can keep meeting Notes for each of the projects in the Project folder, close the the task pages. I see it as a good single-repository for all your projects information. Take a look at Smartsheet. Is fully integrated and has both a calendar / todo / gantt chart view. The gantt is way easier to setup and use that MS Project. Great article and guidance on how to manage tasks better. I see this simply as a tool to transfer the tasks out of Outlook and into One Note. The former is too limited in workability; the latter not an email interface/calendar software. However, is there any integration from OneNote back into Outlook that would mark a task as completed? I like Clive's idea of using his calendar as a task management tool, allowing moving around of tasks with durations and deadlines included. Is there a way to create a calendar item with duration directly from an email in Outlook? I.e. if I receive an email requesting 4 hours of my time at some point over the next 2 weeks, can I right click that email and create a calendar event with the body of that email, along with attachments, included in the calendar event? Hey Logan - Yes, there is integration from OneNote back into Outlook that marks the task as completed. When you follow Ryan's approach and send the task to OneNote from the link in tasks, it will automatically put a RED flag next to the task in OneNote. Once you are done with the task, you click the red flag and it will turn into a check-mark, indicating it is completed. At the same time, the task is also marked completed (i.e. check-marked) in your Outlook Tasks list. Anytime you mark the item complete on either OneNote or Outlook Tasks, one updates the other with the same status. When I send a task to OneNote I get indeed the task created in OneNote with the little red flag, but I can't mark it as checked since in OneNote it's saying "we can't find this task in Outlook"
I see how the flags work if you are sending from the tasks list. However, that means you need to create the tasks from outlook email first and then send to OneNote from the tasks page. That seems clunky and not efficient. If you click the flag in the email window, that adds it to your to-do list (not in the task list). When I sent this new to-do list item to OneNote, the task flag does not show. I like the ability to complete the item in OneNote and have it show in Outlook. Can you address the workaround for Task vs. To-do item really increase the efficiency? Thank you in advance! Very stimulating article. It overcomes some of the limitations of Outlook tasks, which become quite pressing in a professional setting. The problem I have with the Tasks is that tasks take time. As soon as I get an e-mail or task that I can give a duration to, I move it to the calendar and set a time and a practical reminder, and if needed make it a repeating appointment if I need to break it up into a number of sessions. Then I can move it around, while recognizing any fixed deadlines. The other limitation I find in Tasks is that I cannot put tasks into dependency relationships. Almost nothing I do stands alone, it is typically linked to what someone else does, or other things that I do...The OneNote idea doesn't solve this, and I'm still trying work arounds that are simple and easy. I'm in the same boat. I'd like to be able to set up reminders to check in with the dependent people and then affect next due date accordingly. Hi, good point. Let us know if you find anything! How about a way ro link MS Project ti Outlook Tasks and/or One note? Thanks for this info: Great information. The one thing this doesn't solve is Outlook still won't let you nest tasks. That's really what we need to make it effective. "Nest"? Could you elaborate please? Associate tasks with parent items so you have tasks and subtasks. Expand a task to see subtasks under it. That way you can use it to manage a small project. As a programmer, all it would take is one field for parent item and replace the list view with a tree view. I've suggested it to the product group for many years now. Although Outlook doesn't let you nest tasks you can get some way towards this by using subpages in Onenote. It isn't a patch on proper MsProject say but visually it can have a similar effect. Nice article! Is there a way to do this on a Mac? Looks very limited. The Outlook Help file has a Compare Mac and Windows Features section and this states that Outlook-OneNote integration is not available for Mac. Access Date: 18 Feb 2017.